Learn what’s new in Intune for Education. Find out about upcoming changes, product notices, and features from previous releases. We revised many of the iOS setting names, tooltips, and categories in Intune for Education to make settings easier to find and understand. For a detailed list of these settings, see iOS device settings in Intune for Education. We adjusted the list of iOS settings in Express Configuration so that you can get your devices and groups set up even faster. You'll see that some settings moved out of Express Configuration, and new settings moved in. The removed settings are still available for you to configure in Groups > Settings > iOS Device Settings. For the full list of device settings in Intune for Education, see iOS device settings and Windows 10 device settings. Windows Update notifications: This setting lets you choose whether or not users see notifications about Windows Updates. Manual Windows Update: This setting lets you choose whether or not users have access to the Windows Update scan, download, and install features. 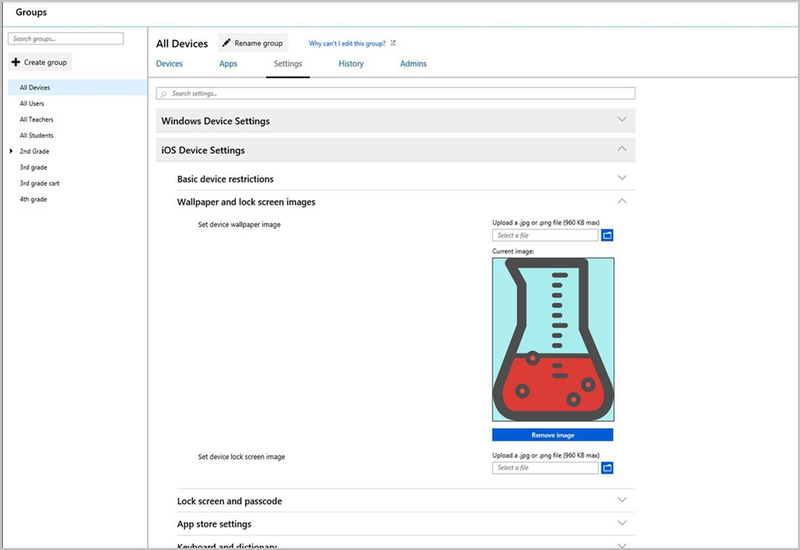 You can now use Intune for Education to set custom wallpaper and lock screen images on school devices. To upload your images, go to Groups > iOS Device Settings > Wallpaper and lock screen images. When configuring settings in Intune for Education for iOS device enrollment, you now have the option to configure your iOS devices to enroll with Shared iPad features enabled. Shared iPad is an iOS feature that requires students and teachers to sign in to school devices with a Managed Apple ID. They can sign in and out of any enabled device in the school to access saved and in-progress work, apps, and tasks. For more information about Shared iPad in Intune for Education, see Shared iPad configuration. Configure preferred Azure Active Directory tenant domain: This setting permits students to sign in to a device without a tenant domain name. Students can sign in quickly and easily with just their alias. Configure new tab page: This setting lets you choose the page that opens when students add a tab in Microsoft Edge. New tabs can open a blank page or a custom one, such as your school's home page. Switch out of S Mode: This setting lets admins switch devices out of Windows 10 in S Mode, or prevents students from switching their own devices out of S Mode. We revised many of the setting names and tooltips in Intune for Education to make them easier to find and understand. For even more details about each setting, see Windows 10 device settings in Intune for Education. Rename any Windows 10 (version 1803 or later) device remotely from the Intune for Education portal. To rename, go to Devices and select a device > Rename device. You can also rename a device from the Device details page. You can now invoke Autopilot Reset remotely using the Intune for Education portal. Autopilot Reset removes all user data including user-installed apps and personal settings and keeps the device enrolled in Intune so the device is kept up-to-date with all the latest apps, policies, and settings. With this feature, you can quickly wipe and reconfigure students' PCs in bulk to prepare them for a new school year. Learn more about Autopilot Reset here. Intune for Education now displays location information for your Apple School Manager VPP tokens, so you can easily identify your VPP tokens from both Intune for Education and Apple School Manager. You can give your VPP tokens nicknames in Intune for Education for easy labeling and organization. Enrollment is now even faster for your iOS devices when you set up an MDM Server Token. Intune for Education automatically configures enrollment settings, so the devices associated with the MDM Server Token have fewer Setup Assistant screens to tap through. unenrolls the device in Intune. removes the device record from Azure Active Directory so the device is no longer part of your environment. Your Windows Store for Education inventory gets unlimited licenses for Immersive reader when you sign up for Intune for Education. Immersive Reader is a learning tool that creates a reading experience with accessibility and comprehensions for learners of all ages and abilities. Learn more about Immersive Reader here. click on a user > Go to user details > choose a device that user has recently checked in with. click on a device > Go to device details > choose a user that has recently checked in on that device. Intune for Education now supports iOS device management in the classroom. We've added new features and pages to Intune for Education to make the setup and management process easy for everyone involved. From the dashboard, you'll have everything you need to successfully set up, configure, and enroll devices. Setup iOS device management: We've added a new page with step-by-step guidance to help you quickly connect your Apple accounts to Intune for Education. On-screen indicators let you clearly see the required and optional steps, the ones you've successfully completed, and the ones that are nearing expiration. Express configuration: Just like our Windows 10 experience, but tailored to iOS devices, express configuration for iOS helps you quickly assign and change apps and settings. Choose a group of users or devices and select from our Microsoft-recommended settings. These recommendations are preselected, but you can change them at any time to match your school's own policies. Apps and settings: We've added separate app and device setting views to help you focus on either iOS or Windows 10 device management. With added Apple VPP support, you can sync your VPP-purchased apps with Intune for Education and assign them directly from the dashboard. Dynamic grouping: Now you can apply a specific device platform rule to your dynamic groups. Create a rule to apply to devices or students on Windows 10 or iOS devices. Get more details and learn how to navigate new pages and workflows in the Intune for Education documentation. You can now view a history of all actions taken by admins to change group admins, apps, and settings for their approved groups. You can find the log of this history in Groups > History. We've added a new report. On the Reports page, you can select Windows Defender report from the list of reports. This lets you view Windows Defender device health status for all your devices. You can see what this looks like in the What are reports? doc. You can now choose groups of people to manage settings for other groups. For example, you could have a group called High School Admins, where the members are your team of admins for high schools in your district. The High School Admins group could be given permission to manage settings for groups of high school students. Find out more in the What are groups? doc. We've added two new options to the sidebar: Users and Devices. You can use these to search for individual users or devices, and quickly open the Details for these items. You can add these searches to the sidebar by See all > Star button (Favorite) to add them to your favorites list. Find out more about remote actions. We've added a new option to the sidebar for Wi-Fi profiles. This lets you define Wi-Fi settings that you can assign to different devices, users, and groups. Define rules and we'll create groups that automatically populate based on them. When adding an app, you'll now see a per-device and per-user status of app installs. Select a user or device in one of your groups. A pane will now slide up from the bottom of the screen that lets you get more information on that object, and the status of the apps and settings that you've assigned to it. Intune for Education is now available! We have launched the Intune for Education portal. Intune for Education is a streamlined experience for schools and educational organizations to manage Windows 10 devices. Find out more about Intune for Education in these docs.